Now booking classes in NM and OR! This article has 5 pages. You're on page 1. Practical long-range rifle shooting is about making first-round hits on targets to the effective range of the rifle, in the field and under time pressure. Practical long-range rifle shooting centers around being able to make first-round hits on unknown-distance long-range targets, while moving through the field, from the best shooting positions available in the terrain. Applications of these skills are both sporting and military. Competitions in this format are split between describing themselves as "tactical" matches and "hunters test" matches. Examples include Dr. David Kahn's Keneyathlon, the Practical Rifle Team Challenge (CO), the NRA Whittington Center's Sporting Rifle Match (NM), the Blue Steel Ranch Steel Safari (NM), and various "Sniper Challenge" matches around the country. Whatever the name, the crux is delivering first-round hits on unknown-distance targets. With off-the-shelf rifles available for under a grand that will hold one-MOA groups, half the equipment problem is easily solved. The other big decision regards optics. What optics should you put on your long-range rifle? A scope for practical long-range shooting needs to do the following: provide a clear view of the target area and a precise-enough sight picture; precisely specify hold-over out to the maximum engagement distance; precisely specify wind drift or target lead or trail out to the maximum engagement distance; and allow optical ranging of targets when a laser range-finder cannot be used. The adjustments need to be 100-percent repeatable; the scope needs to retain its zero. Low-light capability is desirable. The S&B P4 reticle provides an uncluttered sight picture with hash marks every 1/2 mil. 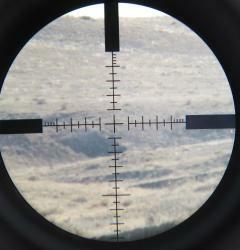 With dope values in mils, simple reticle hold-over can be used on targets to 500 or 600 yards if there isn't too much wind. When you pick up a scope, the first thing you do is look through it, put the reticle on a target, and get a sight picture. In variable-magnification scopes, there are two types of reticles: first focal-plane (FFP) and second focal-plane (SFP). Most shooters are used to SFP reticles that appear to stay the "same size" as the magnification is turned up and down. Paradoxically, this means that at different magnification settings, the reticle features demarcate different angular distances. For example, if the mil-dots are calibrated at 10x, then at 5x, they would actually mark 2 mils. Confusing? It sure is, and that leads us to the solution: the first focal-plane reticle. The FFP reticle appears to "shrink" as the magnification is dialed down, just as the actual target image shrinks. This constant ratio means that the reticle features are always calibrated; 1 mil is always 1 mil regardless of scope power. The shooter can use the reticle for range estimation, elevation hold-over, and windage hold-off at any magnification setting. The downside of the FFP configuration is that the reticle lines can be too fine at low magnification and too thick at high magnification. Reticle choice can be a matter of personal preference, but the reticle needs to provide an uncluttered sight picture and not obscure the target. Since the reticle may be used solely, or in conjunction with the elevation and windage knobs, to specify range hold-over and wind correction, it should have marks at regular intervals. These demarcations often take the form of mil-dots or hash marks. Since both the reticle and the elevation and windage knobs specify angular distances, it is important that the "units" match. If the reticle has mil-dots or mil hashes, then the knobs should use 0.1-mil clicks. If the reticle has MOA-based demarcations, then the knobs should use 0.25 or 0.50 MOA clicks. When the units match, there is no math required to convert between using one or the other, and aiming corrections can be done with either the reticle, the knobs, or a combination. The reticle marks used for elevation and windage hold-off should be close enough to provide useful intervals, but not so close as to cover parts of the target. 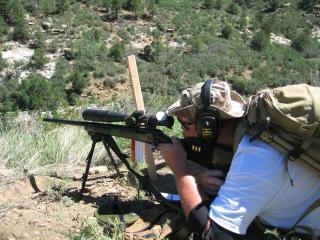 For windage and elevation, marks at 1/2 mil or 2 MOA work well.